The daughter of Marylou Widmer prepares to drop off the family dogs at Pima Animal Care Center after personal issues forced the family to give them away. In this 2014 file photo, dogs at the Pima Animal Care Center wait to be adopted. A watering trough runs through kennels in the main area of the 46-year-old Pima Animal Care Center like a river, providing dogs with needed hydration. A single sneeze or misplaced waste can transform this life-giving water into a tributary for disease and discomfort — just one of the glaring problems that surfaced as the almost five-decade-old building evolved from a county pound to a facility focused on caring for animals. 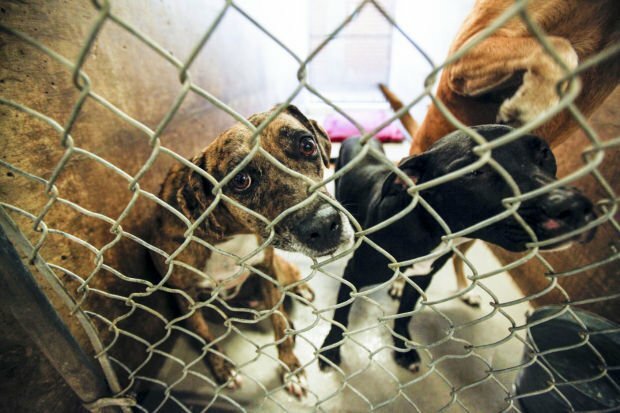 Next month, Pima County voters will be asked to approve Proposition 415, a $22 million bond that would be used to update Pima Animal Care Center, or PACC. As many as nine small dogs or four large dogs fit into a kennel meant for half that number. There are no separate spaces for eating, sleeping, and waste. The facility is very noisy, and cats and dogs are kept in close quarters, which causes increased stress on the animals and contributes to the spread of disease. The proposed $22 million would be used to build a new facility nearby. The new structure would include quarantined areas to isolate the sick animals, quieter and larger kennels, and separate areas for customer service, adoptions and intake of stray animals. Officials haven’t yet determined what to do with the existing facilities once a new one is built. “Stress is directly immunosuppressive, so cortisol levels directly hammer your body’s immune system,” said Dr. Jennifer Wilcox, the shelter’s veterinarian. According to Hollish, PACC took in 24,000 animals in the fiscal year of July 1, 2013 to June 30, 2014. Of that number, the live release rate was 76 percent — meaning 18,240 animals stayed alive. The other 5,760 were either euthanized or died of other causes. “We’re trying to be an animal welfare agency, we’re trying to meet national standards and implement the best practices for shelters and animal care enforcement,” said Kristin Barney, PACC’s chief of operations. Vince Rabago, the official co-chair of the Pets Are Worth Saving-Proposition 415 campaign in support of the bond, said seeing the crowding and conditions at the shelter was “a big eye-opener” for him. 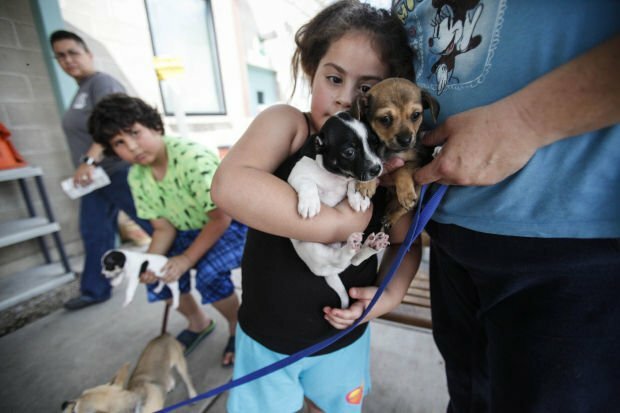 “The better and more humane our facilities are, the more it reduces the number of stray animals out there because people can use a facility designed for adoption,” he said. Rabago added these animals can be used in healthcare, as therapy animals for veterans, and even comfort animals in court proceedings. “There are so many uses that can help other people because someone rescues that dog,” he said. Though Pima County Supervisor Ally Miller voted in favor of putting the issue on the ballot, a press release following that action said she will not support it because of concerns about excessive cost. Miller has declined to comment further on the issue. Wilcox said a lot of things about the current shelter aren’t optimal for keeping the animals healthy. Gabby Ferreira is a University of Arizona student who is an apprentice at the Star. Contact her at starapprentice@tucson.com or 573-4117.